Adding a little dijon mustard, paprika, and shredded muenster to boxed Mac and Cheese takes it slightly out of the realm of comfort food for some–but puts it more in the realm for others. Fortified by a breakfast brownie, we started a gardening project first thing in the morning. This was about cleaning up, not planting. The forsythia on the hillside had overgrown, big branches of a fallen tree had become ensnarled in it, and the ivy that was supposed to be ground cover at the bottom of the hillside was tangled in everything, along with tendrils of some other weed that was the only thing really thriving. I took breaks for two church services, but she kept at it, sending me texts periodically asking that I bring home more leaf-and-lawn bags. While I started Sunday’s massathon, she climbed back onto the hillside; she was accompanied by our neighbor, and I joined the two of them between masses 4 & 5. 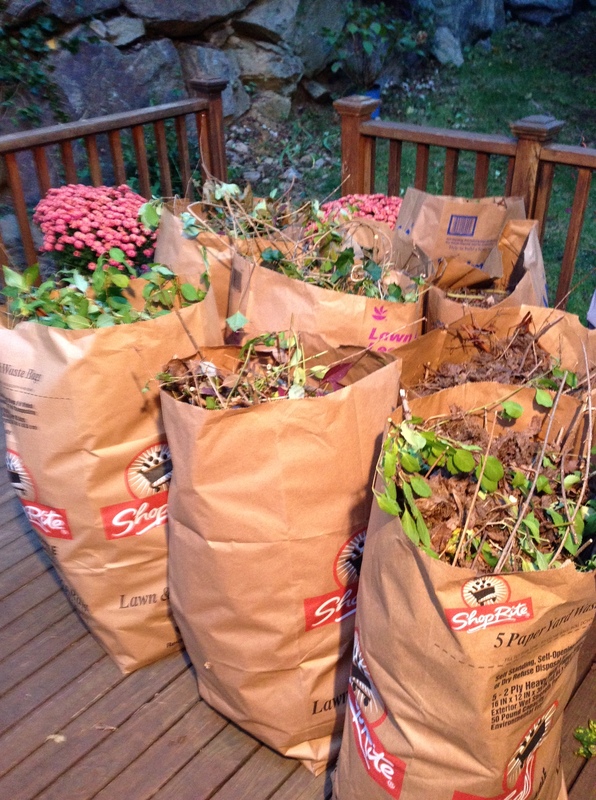 By the end of the weekend, there was plenty of space for the ivy to do its thing, just the right amount of forsythia for the space, three Prius-loads of filled-to-the-brim leaf bags bound for the city’s lawn-waste site, and the satisfaction of a job well done and without injury. 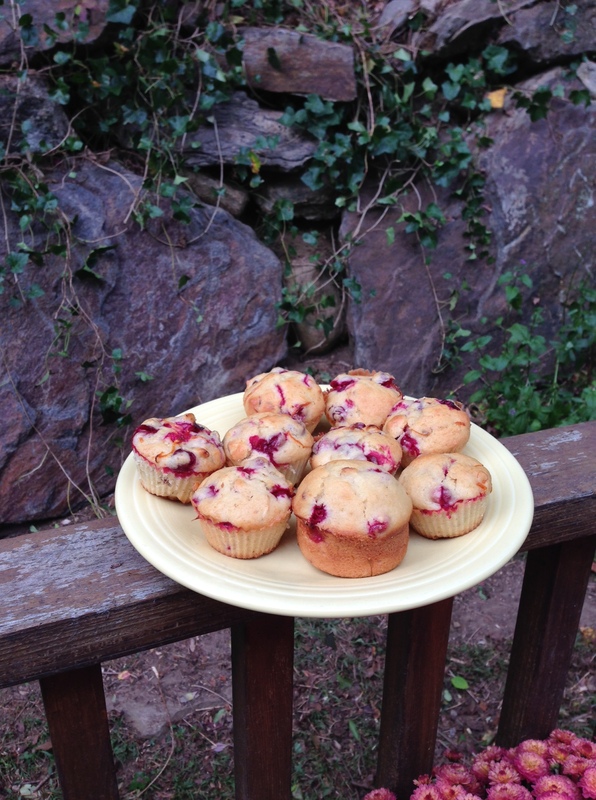 I preheated the oven while we ate, and with the energy conserved by ordering dinner, I gathered ingredients and she mixed a batch of cranberry-orange muffins for this week’s breakfasts. 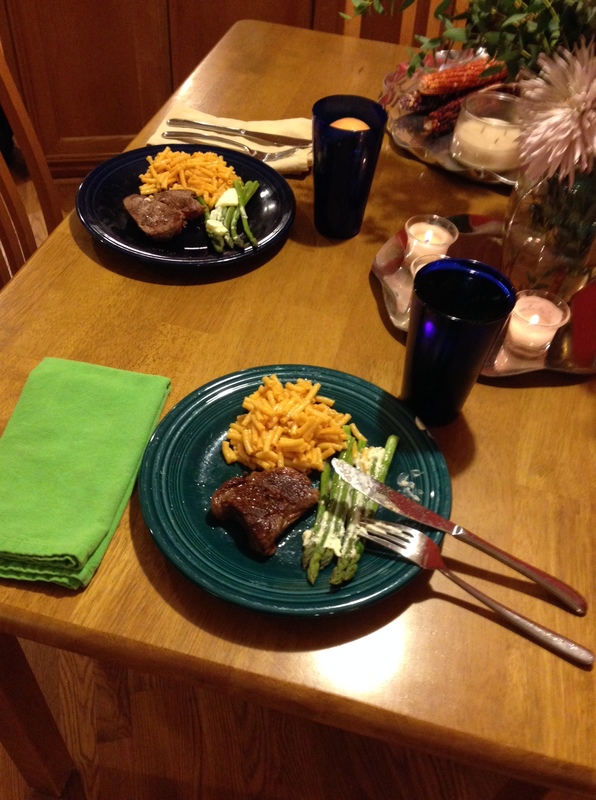 They’re not exactly the Better Homes and Gardens Cookbook recipe; it turns out she improvises, too (and then carefully notates how well things work). Preheat the oven to 400 degrees and prep your muffin tin for 12 average-sized muffins. Zest a large orange; reserve the zest in a small bowl and then squeeze every last drop of juice into a measuring cup. Pour enough cranberry juice cocktail into the cup to bring the total volume up liquid up to 2/3 of a cup. Add 1/4 of a cup of cooking oil to that measuring cup, and stir well to combine. Set aside. In a large bowl combine 1-3/4 cups flour, a scant 1/3 cup sugar, 2 tsp baking powder, and 1/4 tsp salt. stir to combine, then make a well in the center. Set aside. In another small bowl (or the cup used to measure the flour), beat an egg. Pour the beaten egg and combined liquid into the well of the flour, and stir to combine. Continue stirring, scraping the bowl as necessary, until all of the dry ingredients are incorporated and the batter is smooth. Fold in one cup of whole frozen cranberries (or thoroughly chilled fresh ones) and a sprinkling of slivered almonds. Scoop the batter into the muffin tins. Remember the reserved zest and sprinkle a few pieces on the tops of each muffin, giving a quick stir with a small spoon to cover them with batter. Bake until the tops are golden and the tiniest bit of brown starts to show at the edges, approximately 22 minutes. Remove the pan from the oven and set it on a wire rack to cool for twenty minutes, then remove the muffins from the cups and allow them to cool completely. Enjoy with butter or clotted cream. As with brownies, waiting for muffins to cool is very much the hardest part. We finished Sunday evening with a mini-marathon of 1950s TV game shows, confident that we would be well fed and cooking-panic-free all week, and recognition that–although there is always more to do–we’d accomplished quite a bit. Like untangling weeds from ivy, making a home takes time. This entry was posted in Uncategorized and tagged Baking, Gardening, Mexican, Theatre, Weekend. Bookmark the permalink.